(NaturalNews) According to the Centers for Disease Control and Prevention, one in three U.S. adults suffers from high blood pressure – that's around 70 million people. Only one half of those suffering with high blood pressure actually have their condition under control, and treating high blood pressure costs the U.S. $46 billion every year. A recent study reported on by the Daily Mail has found that something as simple and cheap as drinking cherry juice is just as good as the medications that are usually prescribed to help people suffering with high blood pressure to get their condition under control. This is fantastic news, and supports the growing body of evidence that natural remedies actually work better than allopathic medications. As reported by the Daily Mail, a study published in the American Journal of Clinical Nutrition found that people who drank 60ml of cherry concentrate diluted with water actually saw their blood pressure drop by 7 percent within three hours. Scientists think that this is enough to slash the risk of stroke by 38 percent, and reduce the chance of developing heart disease by 23 percent. The scientists at Northumbria University that were responsible for the study, say that the results seen are similar to those achieved by taking blood pressure medication. The scientists think that the reason that cherry juice has such a strong impact on blood pressure is that it is rich in phenolic acids, which are a type of antioxidant. 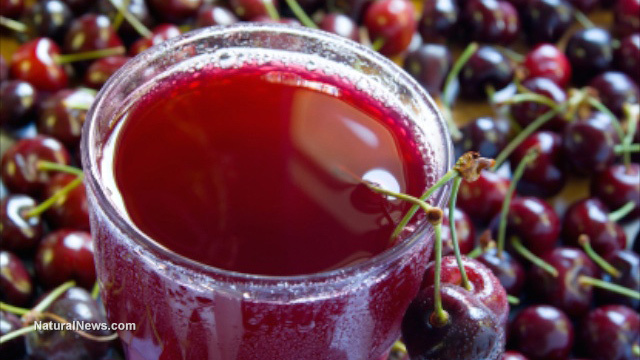 The study found that the greatest improvement in blood pressure occurred when two of the phenolic acids present in cherry juice reached peak levels in the patient's bloodstream – protocatechuic and vanillic acid. The lead scientist, Karen Keane, stated that, "The majority of cardiovascular disease is caused by risk factors that can be controlled, treated or modified. These include high blood pressure, cholesterol, obesity, tobacco use, lack of physical activity and diabetes. ... Raised blood pressure is the leading cause of deaths from cardiovascular disease, yet relatively small reductions in blood pressure can have a large impact on mortality rates." • Watermelons – proven to prevent arterial walls and veins from hardening, according to a study published in the American Journal of Hypertension, as reported by Top 10 Grocery Secrets. Amino acid L-citrulline is also found in watermelon, and can help normalize blood pressure. • Blueberries – now labeled a "superfood," blueberries have more antioxidants than any other berries, and can help lower high blood pressure by fighting against free radicals. • Avocados – full of potassium and magnesium, which are important minerals for lowering blood pressure. • Broccoli – packed with fiber, potassium, calcium, magnesium and vitamin C, broccoli also contains sulforaphane glucosinolate (SGS), which has been proven to significantly improve blood pressure and kidney function. • Kiwi – this small but mighty fruit contains lutein, which is a powerful antioxidant that lowers blood pressure. • Dark chocolate – probably the favorite on the list of foods that help lower blood pressure, dark chocolate contains antioxidants known as "flavonoids" that fight free radicals and improve the elasticity of the blood vessels. Incorporating the above healthy foods into your diet can help prevent and combat high blood pressure, along with all the associated illnesses that are caused by the condition.